Today’s Nice Price or Crack Pipe 323 has a storied past—one that includes record runs at the Bonneville Salt Flats. It’s now said to be toned down and street legal, but will this former racer’s price set a new record here? You can’t blame Isuzu for trying. I mean look at all the interesting stuff they threw at the U.S. market trying to get something—anything—to stick. It was of course all to no avail, and the former GM partner in crime eventually folded up their tent and went home, leaving only some commercial trucks here to remind us that they once existed. Well, that’s not actually true, they also left a small garrison of used cars here for us to consider. One of those was yesterday’s 1999 VeriCROSS Ironman, a model that was crazy-rare even by Isuzu sales standards. That rarity didn’t seem to help its price however, and it fell in a how-can-I-miss-you-if-you-won’t-go-away 76% Crack Pipe loss. 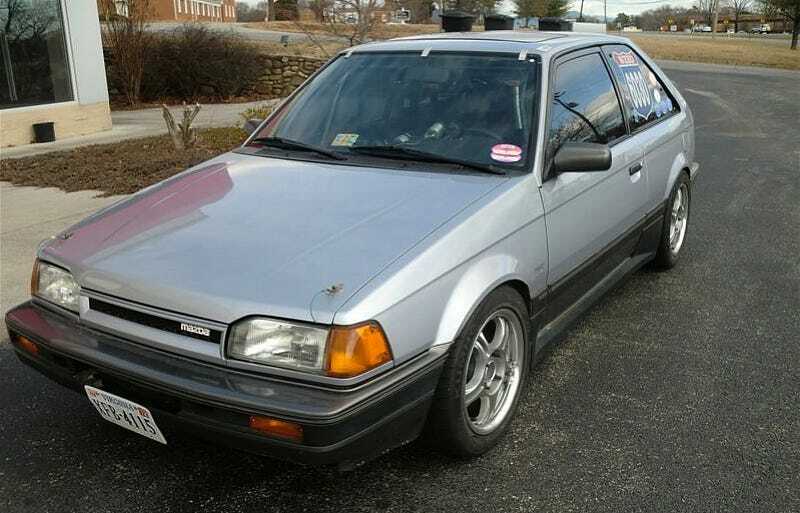 If you didn’t like that AWD nineties Japanese car’s price tag maybe you’ll kitten to the lower one on today’s AWD eighties Japanese car. What we have here is a 1988 Mazda 323 GTX, the short-lived all-singing, all-dancing edition of what was once a Great Little Car. These were raced with some success in WRC Group A, and in fact the seller for this one claims that it was originally one of six cars bought by an Ohio dealer to contest the series. Following that career, the ad continues, the car was then repurposed as a Bonneville Salt Flats speed record contender. That’s right, Moon discs, the Flat Earth Society, and a coating white powder that isn’t cocaine despite this being a car from the eighties. Contributing to the car’s racing aspirations were a triangulated cage, half-stripped interior, and a bunch of extra gauges on the dash to monitor the goings on of the heavily modded DOHC four under the hood. Those engine mods include a billet crank, forged I-beam rods, adjustable cams, and a nest of snakes exhaust header feeding the forward-mounted snail. All that was apparently good for a 177-mph run on the Flats, as documented by one of the two official BSF plaques mounted on the dash. To get that kind of top end, you generally need a big turbo. That however makes for nothing down low, and so the Salt-assault snail has been tossed and replaced by a more street accommodating one from a Porsche 944. Oh, and you also get a second mill, more clutches, a couple of heads, some racing wheels, and the passenger seat to boot! Speaking of seats, the Kirkey Racing bucket in the car at present looks amazingly like Spongebob’s biffle, Patrick. Yep, you can’t un-see that now! There’s not much of a description in the ad as to the car’s current condition, other than the standard “starts and runs well,” which if you’re trying to sell a car and it doesn’t do that you’re sort of eff’d. Personally, I’d like to know about the condition of those AWD diffs, if the car meets emissions anywhere, and how tight the suspension might be. Of course, I’m funny that way. You might be more of a gambler and perhaps would consider this former racer and its price tag without trepidation. If that is the case then we should start thinking about that price tag. The Buy it Now for this GTX and its associated provenance is $9,500 and it has an unmet starting bid of seven grand. What’s your take on this record-setting Mazda, its apparent garage full of spares, and it’s $9,500 price? Does that seem like a fair deal for a former Salt star? Or, is that just too much dough for a tired old racer? eBay out of Roanoke VA, or go here if the ad disappears. H/T to Ballasted for the hookup!